^ Berger, Klaus. Géricault and His Work. Lawrence: University of Kansas Press. 1955: 78. ISBN 9780878171989 （英语）. ^ 2.0 2.1 The Raft of the Medusa. Louvre. [2008-11-19]. （原始内容存档于2012-12-09） （英语）. ^ 3.0 3.1 Phạm Việt Hưng. Chiếc bè của chiến thuyền Méduse. Vietsciences. 2010-07-21 [2016-08-10] （越南语）. ^ Zarzeczny, Matthew. "Theodore Géricault’s 'The Raft of the Méduse' Part I". Member’s Bulletin of The Napoleonic Society of America, 2001年秋. ^ Zarzeczny, Matthew. "Theodore Géricault’s 'The Raft of the Méduse' Part II". Member’s Bulletin of The Napoleonic Society of America, 2002年春. ^ 6.0 6.1 6.2 Grigsby, Darcy Grimaldo. Extremities: Painting Empire in Post-Revolutionary France. Yale University Press. 2002: 177. ISBN 0-300-08887-6. ^ Eitner, Lorenz. 19th Century European Painting: David to Cézanne. Westview Press. 2002: 191–192. ISBN 0-8133-6570-8. ^ Touboul, Adrien (Director) and Borias, Georges-Antoine. 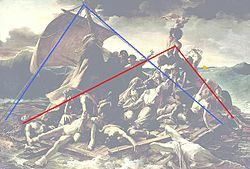 Géricault: The Raft of the 'Medusa (The Roland Collection of Films on Art). 事件发生在 2:19. 1968. ^ Thư Ngân. Chúng ta đang trên chiếc bè Méduse. tuanvietnam.net. 2010-07-28 [2016-08-10] （越南语）. ^ Miles, Jonathan. Death and the masterpiece. The Times. 2007-03-24 [2008-11-20]. ^ Brandt, Anthony. Swept Away: When Gericault Painted the Raft of the Medusa, He Immersed Himself in His Subject's Horrors. American Scholar. ^ Noon, Patrick; Bann, Stephen. The Raft of the Medusa in Britain. Crossing the Channel: British and French Painting in the Age of Romanticism. London: Tate Publishing. 2003. ISBN 1-85437-513-X. ^ Boime, Albert. Art in an Age of Counterrevolution 1815–1848. Chicago: University of Chicago Press. 2004. ISBN 0-226-06337-2. ^ Banham, Joanna. Shipwreck!. Times Educational Supplement. 2003-02-21 [2008-01-06]. （原始内容存档于2009-03-16）. ^ Hagen, Rose-Marie; Hagen, Rainer. What Great Paintings Say 1 25. Taschen. 2007: 378. ISBN 3-8228-4790-9. ^ 17.0 17.1 Muther, Richard. The History of Modern Painting 1. London: J.M. Dent. 1907. ^ Wilkin, Karen. Romanticism at the Met. The New Criterion. 2003, 22 (4): 37. ^ Miles, Jonathan. The Wreck of the Medusa: The Most Famous Sea Disaster of the Nineteenth Century. Atlantic Monthly Press. 2007. ISBN 978-0-87113-959-7. ^ Novotny, Fritz. Painting and Sculpture in Europe, 1780 to 1880. Baltimore: Penguin Books. 1960. ^ Christiansen, Rupert. The Victorian Visitors: Culture Shock in Nineteenth-Century Britain. New York Times. 2001-06-03 [2008-01-04]. ^ Wrigley, Richard. The origins of French art criticism: from the Ancien Régime to the Restoration. Oxford: Clarendon Press. 1995: 76. ISBN 978-0-19-817409-7. ^ Barnes, Julian. A history of the world in 10 1/2 chapters Paperback. London: Picador. 1990: 126. ISBN 0-330-31399-1. ^ Crossing the Channel. Minneapolis Institute of the Arts. 2003 [2016-08-08]. ^ Morse's Gallery of the Louvre: A Transatlantic Mission. Terra Foundation for American Art. [2009-05-06]. （原始内容存档于2012-03-30）.